For years I insisted I was not a lister. Mind you, I’ve never been opposed to keeping lists. That would be about as silly as being opposed to people collecting acorns, baseball cards, or buttons. Simply put, I’m just not into collecting. But as for not being a lister, I recant. Upon reflection, I find that I am in fact an assiduous lister and that I dedicate a great deal of my life to the gathering of list-worthy entries. It’s just that the things I list have more to do with recording behavior and anomalous encounters than with simply listing bird names. For a bird to make my list it needs to do something more noteworthy than just cross a political boundary, which it doesn’t recognize anyway. Also, a bird doesn’t have to be new for me (i.e., a life bird) to make my list. It just has to do something noteworthy. Examples of list-worthy birds (as I see them) include the Yellow Warbler evidently migrating on the somewhat early date of July 22. Another example is the two American Robins that collided in flight one day several years ago, injuring one. Great aggregations of birds always rate an entry in my list, such as the 15,000 Ring-necked Ducks I counted on a sand-plant pond this past April. So too do early arrival and late departure dates. One of those Ring-necked Ducks was still present on July 20. That is way late for a Ring-necked Duck in New Jersey—in fact, a new record by five weeks. Of course, if I do find a bird that is new to me or to my home turf, I include it with all the other notable entries. I just don’t, as a rule, run halfway across a state to see a bird found by someone else when there are noteworthy and highly list-worthy encounters within walking distance of my door. In fact, some epic encounters require no walking at all. Last July, from my porch, I saw an American Robin collecting nesting material. It was second-brood time! That’s an eminently list-worthy observation. Had I jumped in a car that morning to go see the European GoldenPlover up in Hunterdon County I would have missed this seasonal milestone and journal-worthy entry. Besides, I already have Pluvialis apricaria for New Jersey, on July 10, 1982, in South Cape May. The unphotographed sighting was not accepted by the state records committee, but they keep their list and I keep mine—as all-encompassing as it might be. The other great thing about keeping a life list that embraces all manner of significant avian encounters is that it makes better reading than lists whose focus is the mere re-numeration of first encounters. Heck, the cumulative entries of my New Jersey Noteworthy Encounters List alone tops the highest species list tallied for all of North America. 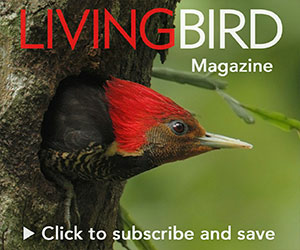 So fellow student of birds (as we used to call ourselves, back when our avocation was casting about for purpose, meaning, and respect), you may never tally 900 species of birds in North America, but I’m confident you can record 10,000 listworthy encounters with birds in North America, starting right now in your own backyard. So, list on. See, hear, and record great and noteworthy things. Commit them to paper or to microchips. Me? I arrange my encounters by date in a book marked “Journal.” But if you have a different system—say, one that organizes according to the AOU order—well it’s your list to do with as you please. I do have a question, though, and maybe a challenge. What are your top 10 avian encounters of all time? I’ll bet that will keep you occupied for a while.